Fusarium is a genus of fungi widely distributed throughout the soil. Most of the Fusarium genus is harmless to plants and animals. However, there are certain Fusarium species that contain mycotoxins which are dangerous to humans and other animals. Additionally, there is a species of Fusarium (Fusarium oxysporum) that infects plants and causes wilting, commonly called Fusarium wilting. As a soil-borne pathogen, it is near impossible to eliminate in an outdoor growing situation, and the only solution for outdoor growers is to seek out new land or attempt to improve the soil with a better set of environmental microbes, but there are no guarantees. Fungicides can be used, but many are dangerous to human health and inappropriate for use with cannabis. 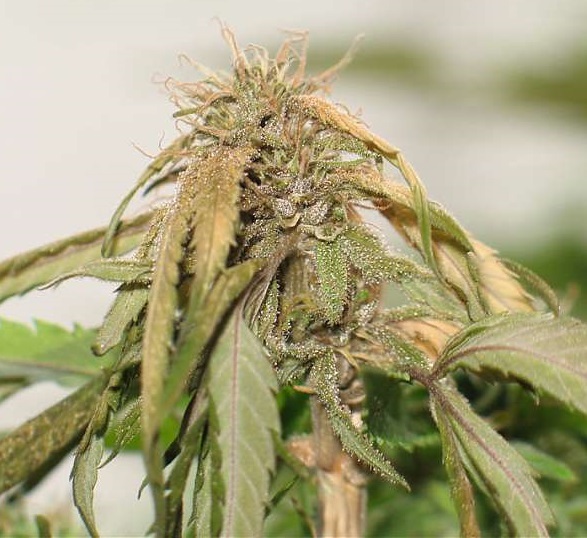 For indoor growers, fusarium wilt is often handled by quarantining infected plants and sanitizing rooms and areas where infected plants were found. In extreme cases, infected plants should be destroyed and any medium they were in contact with should be disposed of appropriately. Any pot the infected plants were contained in should be sanitized heavily or disposed of.In areas where oxysporum is ubiquitous, plants can be bred for resistance to the fungus, but this may cost more time and effort than simply moving.